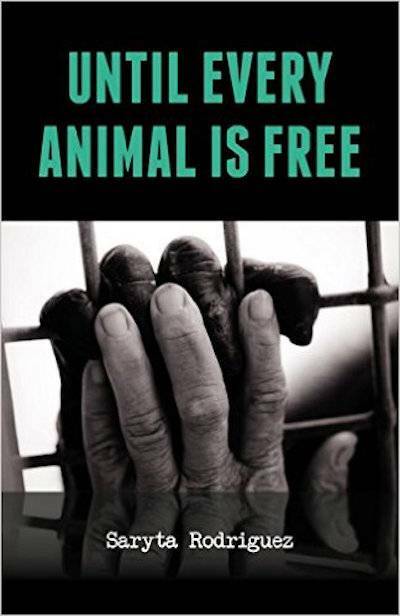 Excerpt from "Lifting the Veil," Chapter 3 in Until Every Animal is Free by Saryta Rodríguez. We all drank the Kool-Aid about animal testing. It hasn’t worked. It's time to refocus and adapt new methodologies for use in humans to understand disease biology in humans. We all drank the Kool-Aid on that one, myself included. With the ability to knock in or knock out any gene in a mouse—which can’t sue us—researchers have over-relied on animal data. The problem is that it hasn’t worked, and it’s time we stopped dancing around the problem. … We need to refocus and adapt new methodologies for use in humans to understand disease biology in humans. Noteworthy publications such as the British Medical Journal and the Journal of the American Medical Association have published numerous studies concluding that, owing to our fundamentally different biological makeups, animal testing cannot reliably predict how humans will react to a particular product, nor can it adequately determine the effectiveness of treatments and cures designed for humans. 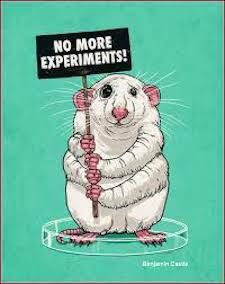 In fact, a vast majority of animal experiments fail to lead to medical advances. Many yield misleading results that are useless at best, dangerous at worst. None of this matters. Why? Because even if we “needed” to test on animals in order to ensure product safety or cure diseases, the bodies of others do not belong to us. Animals are not property. They are not instruments. This is perhaps the second most commonly brought-up topic among my non-liberationist friends (the first being, of course, the nutrition angle—Where, oh where shall I ever get enough PROTEIN?!). It is one of their “aces in the hole”—or so they think. Animal testing and nutrition are the two arguments to which I’ve most commonly been exposed by individuals in my life; as a result, I’ve taken it upon myself to learn the ins and outs of both. Ultimately, activism isn’t about just saying whatever we as activists want to say, or feel is most important for others to hear; it’s about saying everything that needs to be said in order to save as many lives as possible. To abstain from engaging in conversations like these, or knowing the facts with which to dispel myths like “we need meat for protein” and “we need animals to cure cancer” simply because those matters aren’t important to us as individuals is, I think, a grievous error in judgment. If we want to change minds, we have to be prepared for these types of discussions—whether we like them or not. The limitations of animals as stand-ins for human patients are a major reason (for drugs to fail). Animal disease doesn’t faithfully replicate asthma, for instance. The condition is uniquely human … and animal models can’t capture the constriction of airways and all of the other characteristics of the disease. We have found great mechanisms that can control asthma in an animal, and most of them have failed in humans. Dr. Akhtar also cited a study published in the Proceedings of the National Academy of Sciences in February 2013, which revealed that, as the title of the study purports, “Genomic Responses in Mouse Models Poorly Mimic Human Inflammatory Diseases.” In other words, mice do a poor job of replicating the inflammation that occurs in humans and leads to various diseases, disorders, and conditions, such as Alzheimer’s, celiac disease, and multiple sclerosis. Beyond being unable to replicate asthma—one ailment—inability to replicate inflammation in general results in an inability to adequately replicate a wide variety of ailments—many of which are fatal if not properly treated. This poor mouse was subject to some sort of surgical procedure. Not only did they personally not need the procedure in the first place, but, in all likelihood, no painkillers or anesthetics were offered whatsoever. 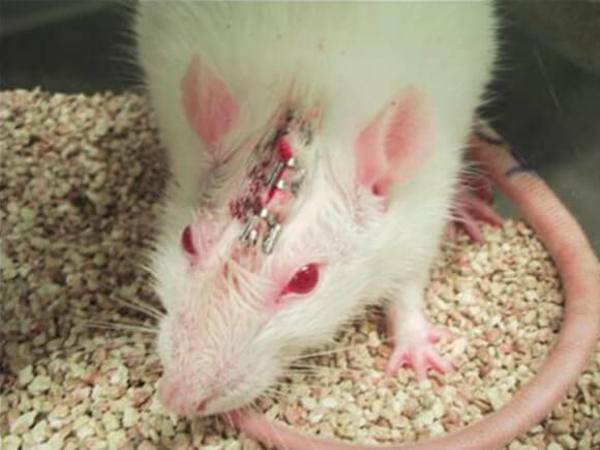 The pain and suffering of animals in labs is not considered a priority to the companies that oppress them, and animals are routinely operated on without the administration of pain relievers. Mice are the most commonly-used animals in scientific research, yet they have proven to be incapable of mimicking one of the most common, most prominent conditions experienced among humans—a condition that can lead to crippling and even terminal illnesses. So, why do we keep using them? We can no longer rely on studies on mice and rats. It is now imperative that we focus on human islets. At the end of the day, it is the only way to understand how they function. Unfortunately, this institution tested on mice and rats for over thirty years before making this discovery. That’s thirty years’ worth of lives wasted—countless lives daily, times 365, times thirty… So much pain, suffering, and ultimately, death—and no advancement in understanding diabetes made therefrom whatsoever. Those animals are gone now, and we cannot bring them back, but we can prevent others from experiencing the same fate. Stressed nonhuman animals yield poor data. Animals in laboratories are involuntarily placed in artificial environments—usually in windowless rooms. Routinely, these animals are caught from their cages, placed in restraining chairs, have blood taken from them, and subjected to experiments that cause significant pain. Dogs, cats, monkeys, rats, mice and other animals are often denied food, water and even pain medications. They are burned, irradiated, crushed, shocked, poisoned and infected. It’s important to understand how animals live in modern laboratories because what we do to them—how we house them, how we handle them, how we experiment on them—all can cause misleading research results that eventually harm us… there is a phenomenon in laboratories known as “contagious anxiety.” Blood pressure and heart rates shoot up in rats watching other rats being decapitated. Cortisone levels rise in monkeys watching other monkeys being restrained for blood collection. Just the routine laboratory procedures, such as catching an animal and removing him from his cage, in addition to the experiments themselves, cause significant and prolonged elevations in animals’ stress markers, which can affect research results. The Moral Imperative here should immediately horrify you upon reading these words. These animals are being tortured. They are not simply being observed; they are living lives of pure misery, and often the effects of testing end those lives. For those of you who may not be sympathetic to the plight of these animals, these words should nonetheless drive the point home that any study based on the reactions of nonhumans in these conditions simply cannot tell us anything of value with respect to how humans, in decidedly different conditions, would react to the same stimuli, or the same combination of chemicals. Even a seemingly innocuous procedure, like drawing blood, is incredibly stressful for the nonhumans to whom it is done. 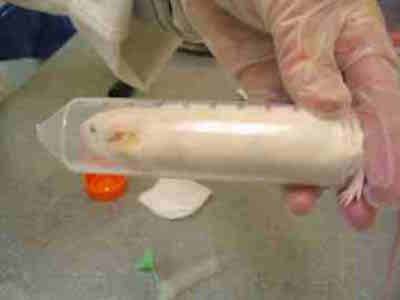 As shown above, mice are shoved into tiny tubes so as to restrain them while blood is drawn. Imagine the confusion and fear they experience- not to mention the pain of the blood extraction itself. The New Scientist article “Too Stressed to Work” reveals how stressed rats develop lasting inflammatory conditions—though not similar to those developed in humans—which cause intestinal leaks. On a moral level, this should upset you; you should not want to contribute to the leaking of another living being’s intestines. On a selfish level, this should also upset you; you should not want your medications to be developed based on how a rat with leaky intestines reacted to it. After all, you’re not a rat with leaky intestines, are you? PETA’s website offers a detailed list of alternatives to animal testing, which includes but is not limited to the use of available human tissue that would otherwise go to waste. Not only is this a more compassionate solution, but it also yields more accurate results. What could be better to help us understand the effects of products, illnesses, or medications on humans than testing them on cells that are decidedly human? Human tissue can also be synthetically developed. Pioneering contract research laboratory CeeTox uses human cell-based in vitro (test tube) toxicity screening to test drugs, chemicals, cosmetics, and consumer products. These humane tests replace cruel tests that involve pumping substances into animals’ stomachs and lungs and dripping chemicals into animals’ eyes or onto their raw, shaved skin. Researchers with the National Cancer Institute, the US military, private companies, and universities across the country have shown that MatTek’s in vitro 3-D human skin tissue equivalent is an excellent substitute for animals when it comes to conducting burn research and cosmetics testing, as well as with respect to conducting research on radiation exposure and chemical weapons attacks. Harvard is just one of many top-tier universities in the US that has eschewed the practice of animal testing. The scientists and engineers at Harvard’s Wyss Institute have since created organs-on-a-chip. These tiny devices contain human cells in a three-dimensional system that mimics human organs. The chips can be used—instead of animals—in disease research, drug testing, and toxicity testing. This is one of the preferred methods employed at Merck Pharmaceuticals by scientists such as Dr. Nicholson. Organs on chips emulate human organs, for biomedical testing that is both morally just AND more accurate! Human skin equivalent tests such as EpiDerm and EpiSkin have been validated and accepted in Canada, the European Union, and other countries as total replacements for animal-based skin corrosion studies. Government regulators in Canada accept the use of a “skin patch test” in human volunteers as a valid replacement for animal-based skin irritation studies (similar to allergy testing, a “skin patch test” is when a small part of skin is exposed to a small dose of the substance in question). The 3T3 Neutral Red Uptake (NRU) Phototoxicity Test was developed and validated in Europe, and has since been accepted at the international level as a replacement for animal-based phototoxicity studies.